Aaagh! Look at all the expectations on this thing! 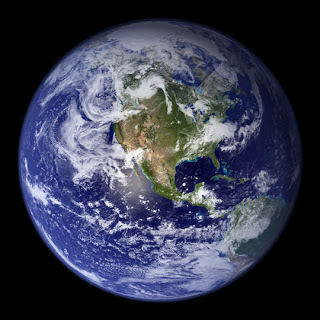 I considered vlogging for my first Apocalypsie post - perhaps busting out my ukulele version of Avril Lavigne's "Complicated," just for grins - but ultimately I decided not to serve you that particular brand of crap sandwich. Be grateful. With my book launch getting closer, I'm in a profound state of discombobulation regarding expectations - not just the expectations of Apocalypsie blog readers, but also the expectations of new Facebook friends, Twitter followers, book bloggers, the entire Internet, the publishing industry, and the planet Earth in general. Not to mention my own expectations. I started writing the manuscript that became Geeks, Girls, and Secret Identities in late 2006, and hooooo-wheee, I didn't know anything at all about the publication process. It was a more mysterious time, sure, and IMHO there's no species of anxiety more horrible than the one driven by lack of knowledge. I didn't really have expectations back then, you know? I tried very hard to avoid a sense of entitlement, first of all, just because I turn into a big jackass when I don't. And I had no external expectations to speak of - not about my choice of subject matter, or contractual obligations, or anything else, really. What I had were hopes, dreams, goals...aspirational stuff. Now, however, NOW, OOOOH IT'S ALL DIFFERENT. Back in March of 2010 Sara Zarr blogged about how the brass ring of publication changed the way she presents herself online (specifically in her blog), and lately I've been thinking about that post on a regular basis. There were so many things I wanted when I was at the very beginning! I wanted to write, above all, but I wanted representation and publication and the thrill of signing a contract and the opportunity to work with the best people and so much more. My desire to be part of the great kidlit continuum has been such a powerful influence on everything I've done and said online for the past six years, and when I was starting from zero there was a pretty frantic quality to my mindset, if not my actual online activity. The road ahead seemed so very, very long. Now that I'm at a different starting point - the start of my career as an honest-to-god published author - I can see that the road goes ever on and on, and that we're not trying to reach the end of the road so much as we're just trying to STAY ON IT. Nevertheless, my desires are busily metamorphosing into new forms. I'm no longer pierced by yearning to just get my foot in the door, because it's in there. I'm working with the editor I wanted to work with from the start; I've got exactly the right agent; I've built some relationships and established some credibility in the industry. My desire to start my career is now obsolete. My desire to publish more books and continue my career is no small thing, of course! Now that my book'll be in print I want it to stay that way, and I want the opportunity to write more books. I really want to infiltrate the conference faculty circuit, because I'm one of those bizarre people that genuinely enjoys public speaking. Above all, I want people to read my book. Ideally people will read it AND like it, but just reading it would be enough for me. I would totally wear this shirt. Of course, that desire for readers is a tremendous catalyst of change, because the concept of "readers" is no longer a misty sparklehorse of a thing, confined to the land of fantasy. I have galleys out in the world; I've already received a few blurbs and Goodreads reviews; the book is being read by real, live, oxygen-breathing people. 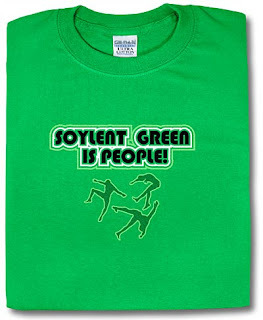 To mangle a perfectly good Soylent Green reference, readers are people! People who have their own desires and expectations for our work and, increasingly, our public personas. It's not nearly the same as those early days when the only people that cared about my pursuit of a writing career at all were me and my wife. My mind is all a-flutter with all these additional people and their cornucopia of potential relationships to my newly established professional identity. How's it all gonna play out? Will I screw up it royally at some point by saying the wrong thing, not saying the right thing, or just acting like a twit? Well, yeah, I've done it a million times before, it's fairly likely that I'll do it again. I hope I handle myself as well as possible as the ground continues to shift around me, though. The things I'll do and say online will change, no doubt - there are just too many new factors at play now that my book is on the horizon. But I think I've been reasonably kind and respectful, and I plan to continue that. I try to communicate my gratitude for all the fabulous new experiences that are coming my way, and that won't become any less of a priority. No, that's not me. I look MUCH more dignified when I cry. I'm also gonna try very hard to curb my expectations around other people's experiences of (and behavior relating to) my book and my public persona. I don't think it's realistic or appropriate to have the default expectation that anyone will like my book, write positive reviews, think I'm funny, agree with anything I say, give me compliments, or support my career. I WANT all those things to happen, sure, I'm not a flipping robot. And I'm not a complete Pollyanna about this, I know it's gonna be hard. Bad reviews will bruise my ego and scuff my confidence. (BTW, advice for coping with bad reviews doesn't get any better than this post by Beth Revis.) Derogatory comments about my manner of presenting myself will be bothersome, if not out-and-out upsetting. And if my book tanks commercially, damaging my future career prospects, well, that'll be the hardest thing of all. But the world doesn't owe me a damned thing. People are entitled to their own opinions of me and my work, even the ones whose opinions of me are unflattering. And every person who spends their hard-earned money to buy my book, uses some of their precious time to read it, or bothers to follow my inane splutterings on Twitter deserves at least a small measure of my gratitude, no matter what their reaction might be. If success in this industry came with a guarantee, it'd come at the price of being drastically less meaningful. I WILL remain both grateful and positive, no matter what may or may not be said about me. I expect no less of myself. 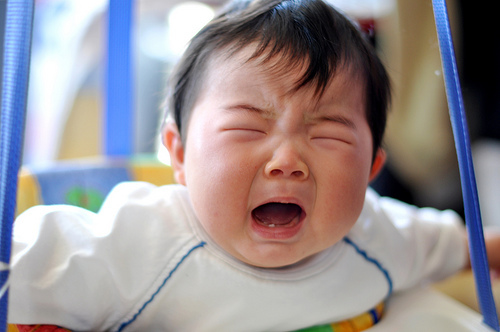 Mike Jung is NOT a big crybaby. He's not. His debut novel Geeks, Girls, and Secret Identities will be released by Arthur A. Levine Books/Scholastic on October 2, 2012. I so hear you, Mike. As to your debut, I have great expectations for it. No one does social connectivity and PR better, and you're a gifted writer to boot. Good reminder to self not to feel the world owes us. Aw, thanks Mirka. I don't know that I agree with your very high estimate of my social connectivity and PR abilities, but I appreciate the kind words! Awesome. I have a debut coming out in Nov 2012 and I'm worried that I'll turn into bookzilla, slapping author copies into the hands of grocery store baggers and my dentist and my step mother (who thinks fiction is morally suspect). This post is a keeper. You're a good guy with a great book, and it's all gonna be fine.